The new version of Skyfire for Android is a getting a special sort of update. It’s actually getting a Facebook update, and it’s being dubbed Skyfire 3.0 Facebook edition for Android phones. Don’t think Skyfire has forgotten about their other versions, in the wake of the release of its popular iPhone version. This update brings a big dose of social networking integration, which seems to be a big trend right now in world of web browsers. 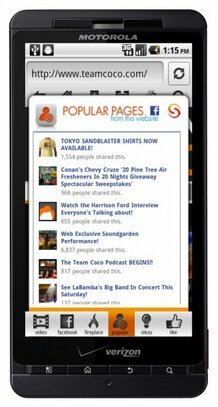 Skyfire 3.0 brings Facebook Connect to your Android phone. Some of the new features include a Facebook button inside of the Skybar, which is Skyfire’s cloud-powered toolbar, and it will allow users to watch video, view related content and share content with their Facebook friends. It will also scan for any comments or “likes” that any of your friends have made about the particular content you are viewing. There is also the new Popular Content button, which tells you what everyone else is reading and what everybody else is saying about the current site you are viewing. Combine that with a built-in “like” button that’s on every page you view within Skyfire. There’s also a Fireplace Feed Reader which integrates a slimmed down version of your Facebook news feed, along with any other social network feeds you might have. There is simple one-click access to your Facebook page, and now support for Facebook in SkyFire’s OneSearch searching toolbar. If all that love for Facebook wasn’t enough, Skyfire 3.0 also includes integration with Twitter and Amazon. Apparently this new version will only be available for a limited time on the Android Market. So I would head over to the Android Market and get your hands on it now. You also need to be running Android 2.0 or higher to download it. Next Entry: Will iOS 4.3 be released on December 13th?